Before profiling it is helpful to make a rough initial cut to the bark on the vamp area. 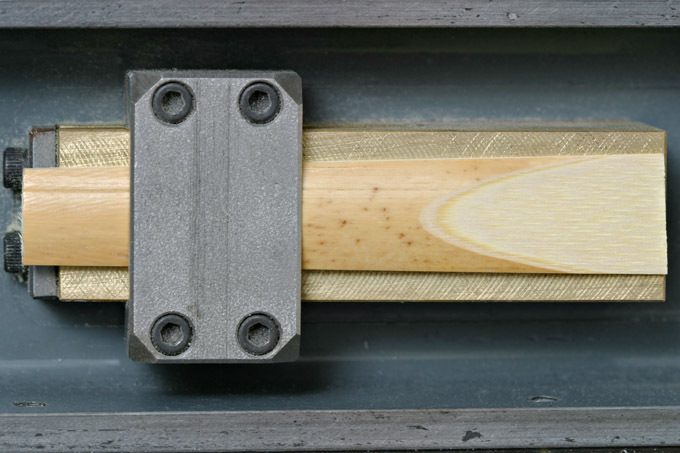 Removing this material saves time during the profiling process and also saves your blade as the bark is the hardest area of the cane. This step can be done by hand with a sharp razor style knife. Long shallow cuts are best, be careful not to cut too deeply or you might ruin your blank. As noted in the section on planing you can quickly do this step on the James planer with his first cut jig(shown on tight). Reeds n’ Stuff also has a specialty tool for this job.